May God and True Parents’ blessings and love be with all regions,mission nations and providential organizations. According to True Parents’ instructions, this to announce the change in the name of the Unification Church World Mission Headquarters, and guidelines for using the emblem of the Family Federation for World Peace and Unification. There reason for the change in the name of our church was explained during the “Proclamation of the Establishment of the Family Federation for World Peace and End of Indemnity” held on November 1, 1996, in Uruguay, South America. With this proclamation, the providential era of indemnity had passed, signifying that we had moved beyond the stage of being a single denomination or religion. In other words, this meant that we entered the providential realm where the four great realms of heart and three great kingships had to take root centering on the family. The following is a background explanation on the establishment of HSAUWC. True Father came to this earth as the messiah, savior, returning lord and king of kings. With the end of the Second World War in 1945, he began his public course centering on the UN providence. From this time Heaven had already created a foundation upon which torestore the Korean people in seven years. However, providence was unable to advance at this time due to the failure of the Christian government and first generation Christians in Korea to accept True Father. Thus, in 1946 True Father went to North Korea, suffered the course of indemnity at Heungnam labor camp, and had to walk the course of separating from Satan while the Korean people were divided into North and South Korea. In order to pay indemnity for this, afratricidal war occurred and with the intervention of UN peace-keeping forces the war ended in a cease-fire (armistice). On May 1, 1954 the Holy Spirit Association for the Unification of World Christianity was established. Ultimately, HSAUWC was created as a providential organization to carry on the providence after Christianity’s failureto fulfill its responsibility. The use of the name “Unification Church” from July 17, 2009 was conceptually different from HSAUWC. The Coronation Ceremony for the Kingship of God in 2001 subsequently opened up an era in which the Unification Church, as a parent religion, could guide the world’s major religions to go beyond all denomination in order to work together in creating God’s peaceful, ideal world while attending True Parents as the messiah, savior, returning lord and king of kings. That is why, True Parents led the providence of bringing an end to the era of restoration through indemnity until 2001, and all providential initiatives after that was carried out to bring all families, tribes, peoples, nations, the world and even the cosmos that was separated from Satan on this earth together into one. Consequently, the 1st to 4th [Jerusalem] declarations regarding Israel (May 18 to August 20, 2003), coronations of the peace king on the tribal level (August 21 to December 31, 2004), coronations of the peace king on the national level (September 26 to December 31, 2004), a coronation of the peace king on the global level (December 13,2004), a coronation of the peace king on the cosmic level (February14, 2005), the coronation of the king of cosmic peace and unity (June13, 2006) and the Coronation for the Authority of the Liberation of God, the King of Kings (January 15, 2009) were held. Following this was the beginning of the era of the Unification Church, which continued side-by-side with the era of the Family Federation for World Peace and Unification. All this was to bring closure to the era of the unity of the religious realm, thereby drawing all religions together into one on the cosmic level, thus ushering in the world of peace and unity centered on God that He had originally envisioned at the time of the Creation. On this foundation, the providential advancements of the Coronation for the Establishment of the Abel UN, True Parents’ Golden Anniversary, and the Seunghwa Festival (April 29, 2010) were achieved and now we await Foundation Day (13th day of the 1st month by the heavenly calendar). We will soon celebrate the providentially historic Foundation Day which is the day God’s dream is fulfilled, signaling the substantial beginning of Cheon Il Guk. According to True Mother’s special instructions for creating an environment for restoration encompassing all people and religions and the substantiation of Cheon Il Guk, the Unification movement, which until now used both the “Unification Church” and “Family Federation for World Peace and Unification” inidentifying itself, shall carry out its activities under the banner of the “Family Federation for World Peace and Unification” as of 11.26 by the heavenly calendar in the 3rd year of Cheon-gi (January 7, 2013).The start of the new tribal messiah providence and manifestation of God’s nation played an important part in this transition. On Foundation Day, to be held on 1.13 by the heavenly calendar this year, an external wedding and coronation of the True Parents of Heaven, Earth and Humankind will be held on the foundation of the internal weddings (held from 2009 to 2012), and all blessed families will take part in a Blessing Ceremony in order to be registered into God’s family and thus to stand in the position of children of God’s direct lineage. Therefore, members of these blessed families must all individually attain the stature of God’s children while at the same time, as a family, be reborn as a heavenly family. In order for this to happen, each family should attend the Heavenly Parents and True Parents of Heaven, Earth and Humankind, and establish the hoondok tradition of reading and practicing the words of life of the True Parents of Heaven, Earth and Humankind. Blessed families should be the example and model of a school of love that perfects the four great realms of heart and three great kingships. The substantial manifestation of Cheon Il Guk is possible when our families serve as an example that can be replicated in our tribes and among our neighbors, thereby expanding the model of ideal families through blessed marriage. 2) The FFWPU emblem shall be used as the official emblem of the International Headquarters. Blessed families should be the example and model of a school of love that perfects the four great realms of heart and three great kingships. The substantial manifestation of Cheon Il Guk is possible when our families serve as an example that can be replicated in our tribes and among our neighbors, thereby expanding the model of ideal families through blessed marriage. (1) FFWPU Headquarters in each nation shall place an FFWPU sign on its building while the local churches shall use the name “FFWPU ( ) Family Church.”The FFWPU emblem shall be used on the church sign. (2) For important events and rallies both emblems shall be used on the banners, pamphlets and other publications with the emblem of the Unification Church on the right and FFWPU emblem on the left. Letterheads shall only use the FFWPU emblem and place it on the right. (3) Please note that for nations such as Japan where HSAUWC is the only entity registered as a religious entity in our movement, the sign may be rendered as “HSAUWC ( ) Family Church.” If you will register a new corporation, please register FFWPU as a religious entity. - Each church shall attach only the emblem of the FFWPU emblem on the front wall in prayer rooms and chapels facing the entrance. - The Unification Church emblem design maybe used for the blessing ring, accessories, necktie pins, seals and other personal ornaments. The FFWPU emblem should be used in publications, programs and other printing material and identification material. - Each church should hoist both the Cheon Il Guk flag and FFWPU flag outside the church. The flag can also be used during events, banquets and other special gatherings. - All blessed families should placethe FFWPU flag on the entranceof their home. When a member of a blessed family passes away (Seonghwa), the FFWPU flag should be draped across the casket and buried together with it. The emblem of the Unification Church symbolizes the ideal kingdom of heaven where humankind and creation have completed the ideal of creation. The center circle in this emblem symbolizes God, the truth, life and light. These four elements emanate from the central circle spreading out to the entire universe in twelve different directions. The number twelve represents the completion number of the four-position-foundation which completed the three object purpose, the twelve months in a year centering on the four seasons, and the twelve personality types. Historically, the number twelve has an important significance in God’s providence. For example, Jesus had twelve disciples. This emblem indicates that the truth (the Principle) can spread out in twelve directions. True Father had said that the basic structure of the kingdom of heaven reflects the number twelve such as the twelve tribes and the twelve personality types. The outer circle symbolizes the harmony created through the give-and-receive action between the incorporeal and corporeal worlds. The square inside the outer circle represents the four directions of north, south, east and west, and the four long columns represent the four-position- foundation. The emblem of the Unification Church comprehensively looks like the helm (wheel) of a boat representing the fact that we ourselves must navigate the cosmos. All aspects of our ideal of the Principle of Creation are included in the emblem of the Unification Church. The FFWPU emblem visually and symbolically represents the ideals and philosophy pertaining to an ideal family centered on God. All the fundamental elements of this emblem were personally created by True Father, who even directly oversaw the details of the entire design process including the arrangement of each element. True Father guided the entire process from manifesting the concept of three generations living together as a family to the size and shape of the sunlight in the emblem. The emblem depicts the sun (symbolizing the heavenly parents) shining brightly in the heavens and below shows three generations — the grandfather (left) and grandmother (right), father (placed in the mid-right) and son (bottom-right) — holding each other’s hand to form a ring-shape. The shape of a heart, the symbol of true love, is situated at the center of this ring. A set of arrows indicating the give-and-receive action forms a circle around the image. 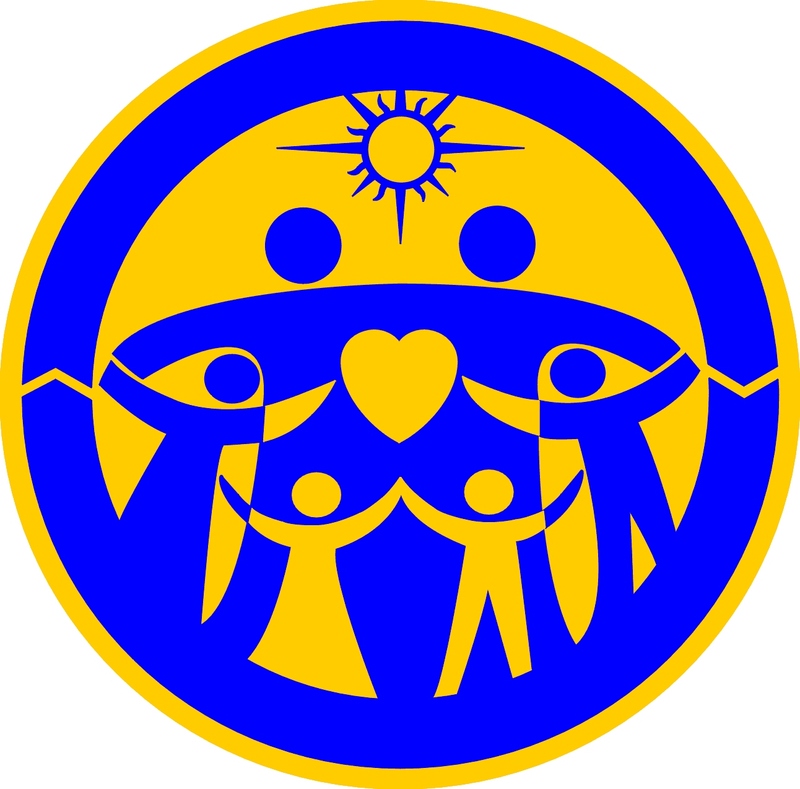 The FFWPU emblem represents the fact that a true family centered on God and true love is the foundation of a true universe. In other words, the significance of the four great realms of heart and three great kingships can be found in the depiction of a three-generational family united centering on true love under the sun that symbolizes God. The outer circle that surrounds this realm of true family signifies an eternally unified heaven and earth (cosmos) that is in harmony centered on a true family. 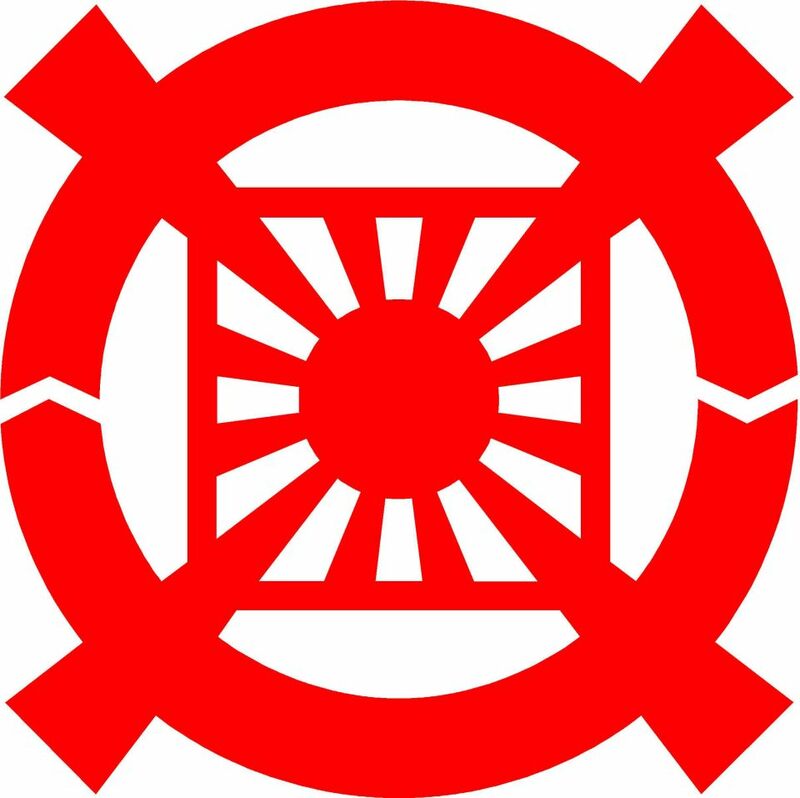 The flag of the Unification Church consists of a red emblem on a white background. The emblem is red to symbolize strength, vitality, passion and assertiveness while the white background symbolizes purity and peace. All things in the universe are created with a relational potential to give and receive. This flag symbolizes the fact that the cosmos is organized centering on God just as the universe is organized centering on the sun of the solar system inhabited by human beings. The center of this flag symbolizes that all the things that we uphold as our ideal are connected. Twelve lines radiate out from this center. The four thick lines represent the four directions. Four directions — in other words, a four-position-foundation must first be established in order for a being to find its place and stand tall. The flag originally symbolizes the nation. The flag of the Unification Church currently represents our church but our ideal is not just confined to the church; rather it symbolizes a unique world which has been our hope throughout history and hope for the present and future,a world that conforms with God’s heart, a single world that fulfills God’s purpose of creation, and the dazzling days from that we will enjoy in that world. Therefore, anybody that lives with God’s heart while embracing this flag in their heart at all times shall have the power to overcome any of Satan’s tribulations or treacherous forces.If you believe this and move forward with courage, God will work through this flag and you wherever you go. True Parents who were victorious in the course of restoration through indemnity are humankind’s eternal True Parents, and as the king and queen of peace they held the Coronation for the Entrance into Cheon Jeong Gung on June 13, 2006 and proclaimed Cheon Il Guk to all of heaven and earth. During this historic occasion, they designated the flag of the Unification Church as the flag of Cheon Il Guk and announced the designation of the national anthem (Holy Song Number 3, Blessing of Glory), national flower (rose & lily), and national bird (crane). The FFWPU flag was designed on the occasion of the inaugural rally of the Family Federation for World Peace which was held on July 30 and August 1, 1996, in Washington DC. On April 10, 1997, True Parents changed the name of the church to “FFWPU” and instructed us to use the Family Federation flag as the flag of the Family Federation for World Peace and Unification. The dark-colored parts of this emblem including its outer circles are navy blue symbolizing hope, peace and freedom while the light areas in between are colored using an orange- yellow hue representing happiness, abundance and health. The width and length of the flag is set at a ratio of 3:2 with the emblem at its center. The diameter of the emblem is one-half of the length of the flag.